15 DIY Mehndi Decoration Ideas At Home That Are Chic And Easily Done! A Mehndi ceremony is one of the most fun & vibrant functions of your wedding. It’s usually a small yet significant ceremony where you get to chill and relax with your loved ones before your D-day approaches! It also calls for the mehndi decoration to be on point because apart from a lot of pictures being taken around it, the mehndi decoration also sets the right mood for the ceremony. It’s also a great idea to DIY a few decor elements to your mehndi ceremony. It’s adds a personal touch to your mehndi decor and also saves some big bucks too! Get a few bird cages in bulk and use them in your mehndi decoration. Decorate these with some flowers and you are all set with a really cool bohemian vibe for your mehndi ceremony! If you don't want to spend a bomb on your Mehndi decoration at home, then DIYing some of the stuff can really add a lot of quirk and warmth to your mehendi! Glass bottles are the best DIY mehndi decoration ideas you can have for your mehendi ceremony, and here’s us listing some inspiration for the same! A cooler way of DIY mehndi decoration stuff is to include beer bottles in the mehndi decoration. Just hang a few bottles on the ceiling with some fairy lights in it, and you are good to go! If you wanna have an all yellow decor for your mehndi decoration at home, then we say why not go all out! We are sure that these huge vases form a part of every household and it’s really easy to replicate. Using some really eye-catching and interesting props will grab everyone’s attention and make your mehndi decor an affair to remember. These transparent umbrellas are really easy to find in the market and you can DIY some really cool and quirky art on them. Another cool way of DIYing props in mehndi decoration is painting some really cool prints on kettles, some really creative & inexpensive mehndi decoration stuff that you can easily execute at your home! We are all up for those really furry and elegant dream catchers to be a part of your mehndi decoration as they look really stunning. However, being a total desi at heart, we are loving this Indian take on dreamcatchers where you can even use bicycle tyres to have a desi-take on them. We are definitely going gaga over this colourful mehndi decor which sets the much-needed vibrant mood for a mehendi ceremony . What we like the most is that the whole decor is so bright and colourful with equally bright and quirky props and yet the theme is perfectly balanced. So make use of some really colourful clothes and add in the props to replicate this mehndi decoration idea at home. Now this dhol cake has to be most offbeat mehndi decoration stuff that we have come across! So get your creative juices flowing and bake yourself a delicacy! Another colorful and creative DIY mehndi decoration idea is Bangle art! You can hang all your unused bangles from the strings, at the ends of your flower hangings or may be on a tree itself. This one has to be the easiest mehndi decoration idea at home. You can bulk buy these tassels at a really cheap rate and make them a part of your stunning mehndi decoration. We love this out of all the DIY mehndi decoration ideas that we have come across because of its emotional factor! You can hang all the pictures taken with your to-be or your dear ones and it’ll be like taking a walk down the memory lane on your big day! You’ve got to adore these inverted buckets which can be used as a part of your mehndi decoration. Just get creative with some unused buckets or just buy a few in bulk and you get yourself a colourful and yet so vibrant mehndi decor! We can never get enough of all the different vehicles used as props for the mehndi ceremony! You can very easily have an auto-rickshaw or a bicycle decorated with flowers and some colourful clothes and your job is done! Such a cool DIY mehndi decoration idea! Swings are really big at weddings these days, and these floral cane swings can be a very interesting addition to your mehndi decoration. 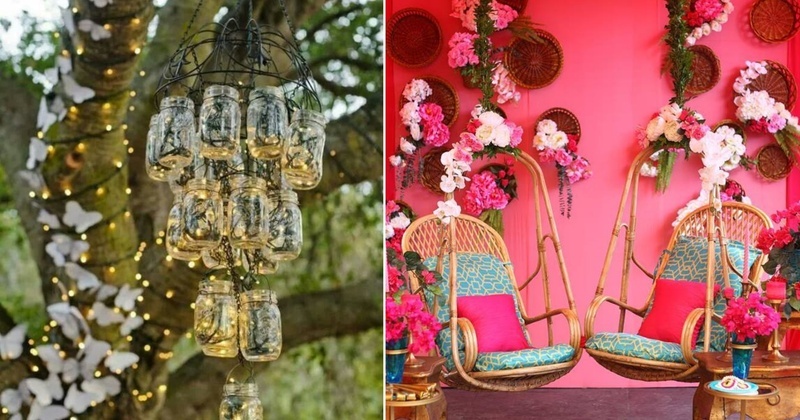 So get canned swings and replicate a decor like this with some creative floral arrangements and candles while always maintaining the colour theme of your mehni decor! How about a golden pot with yellow marigolds flowing out of it, to look like a waterfall? This is one cool and easy to pull off DIY mehndi decor idea! All you need is an earthen pot and some marigold garlands. coolest DIY mehndi decor ideas for your 2018 wedding that are really easy to pull off and you’re welcome!